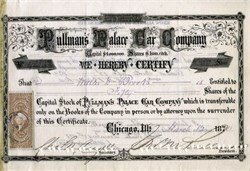 Beautiful stock certificate from the Pullman's Palace Car Company issued in 1870. This historic document has an ornate border around it. This item is hand signed by the Company’s President, George Pullman and is over 147 years old. Punched cancelled. Pullman, George Mortimer (1831-97), American inventor, who designed the first modern railroad sleeping car and patented his innovations—folding upper berths and seats that could extend into lower berths—in 1863. Born in Brocton, New York, he was originally trained as a cabinetmaker and became a building contractor in Chicago in 1855. In 1867 he organized the Pullman Palace Car Company, which manufactured sleeping cars, parlor cars, and dining cars. In 1880 he founded the town of Pullman, Illinois, now part of Chicago, as a community for the workers of his company. The violent Pullman strike in 1894 occurred when the Pullman Palace Car Company reduced wages without reducing rents in the company town. The manufacture and repair of such cars. The manufacture of cars of all kinds for the general market. The care and management, as owner and landlord, of the town of Pullman. In 1880 the company bought 500 acres of land, and upon 300 acres of it built its plant and also a hotel, arcade, churches, athletic grounds, and brick tenements suitable for the use of its employees. The town is well laid out and has a complete sewerage and water system. It is beautified by well-kept open spaces and stretches, flower beds, and lakes. The main object was the establishment of a great manufacturing business upon a substantial money making basis. Efficient workmen were regarded as essential to its success, and it was believed that they could be secured, held in contentment, and improved as such for their own sakes and for the benefit of the company by the accommodations and surroundings that were provided. The company ran into problems with the depression of 1893.